I have told you many times that life is suffering. I have told you that the pleasures of cannabis sativa have no interest for a Buddhist monk such as myself, even if the fragrant odors of a Swiss white widow tingles the inside of my nose and sets me adrift on a sea of tranquility. I have told you many times that an American Buddhist has no need to “blaze the pipe” or take repeated bong hits from a smooth, glass 4-footer, even if it is full with “fluffy nodge”. I have told you that suffering lies in desire, and when I have no desire, I do not suffer. But you do not listen. Day after day your gifts of fine weeds arrive in my post-office box, along with various bowls, papers, and other instruments. Hospitality is important to me, so even though I would have to decline their offer of luscious, resin-encrusted nodules of chronic, I invited them to my shack atop my property for a quick listening session. 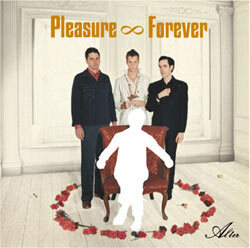 Intrigued, I pushed the volume louder and began to listen to Pleasure Forever’s new album ‘Alter’. I was immediately struck by the excellent tone achieved by the group’s guitarist, which lay somewhere between the classic and the modern. Waves of guitar sounds were overlaid by leads which managed to be subtle yet hinted at epic importance. Organ tones both classical and modern filled the gaps, and created an interplay that I had not heard in a guitar-based band in a long time, if ever. It seemed that what the two fans lacked in subtlety, they more than made up for in musical choice. The singer’s distorted vocals blended with the fuzzed guitar, but at times broke free, as a sea-porpoise breaks the surface of an ocean. For a brief, gleaming moment there is a frozen image of clarity and truth, and then with a giant splash you are submerged in Pleasure Forever’s sea of sound again. 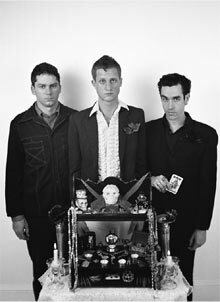 The album moves from gothic-tinged to pop-colored, but always remains anchored in melody and distortion, two of my favorite things. Of course good manners meant I was obligated to accept their gift, and smoke it down to a nub within a matter of minutes. I smiled and closed my eyes again, ready to fall into the dark and textured world of Pleasure Forever. I vaguely heard one of the dudes say “dude I guess Terrence never heard of puff, puff give,” but I didn’t really hear him, I just smiled and allowed my mind to move with the breeze, enjoying pleasure, forever, and the music too. Visit Pleasure Forever’s webpage here. terrence you is funny. pleasure 4ever, man. And lay low on the stay-low, if you get down with the git down… kna’mean? great stuff t-town. long time no see. i’ve been strollin’ the romanian countryside this summer, hunting bears and selling the skins, and looking for the mythical patch of romanian hashish. no such luck, but u know usounds will have the exclusive when i find it. peace, love, and everything in between.